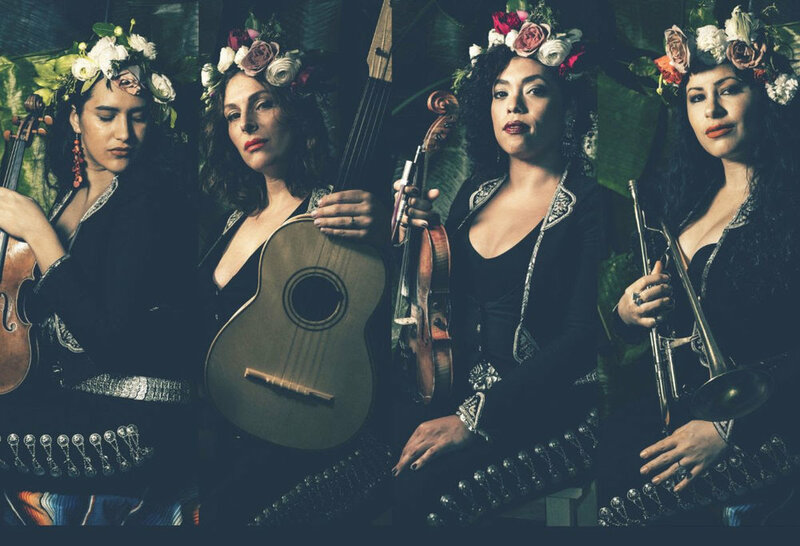 Latin Grammy® winning, New York Based all-female ensemble Flor de Toloache continue to win the hearts of both progressive and traditional mariachi music fans alike through their distinct artistic vision and sophisticated, enlightened interpretation of traditional mariachi instruments. Edgy, versatile and fresh, the group is led by co-band founders Mireya I. Ramos on violin and Shae Fiol on vihuela. Together, they have graced international stages from Chenai, India to Paris, France and have extensively toured the U.S. as supporting act for Dan Auerbach of “The Black Keys”’ new project “The Arcs", as well as Cafe Tacvba, La Santa Cecilia, and Natalia Lafourcade. "Dicen", the group's 2014 breakout single was highlighted by NPR Music's list of The 200 Greatest Songs By 21st Century Women+. Their sophemore album, “Las Caras Lindas”, won the Latin Grammy in the Best Ranchero / Mariachi Album Category, making them the first all-female mariachi group to win in this category. Face of the 2018's Kia Forte campaign celebrating diversity, entrepreneurship and female empowerment, the New York ensemble and beloved press-darlings recently dropped "Besos de Mezcal”, a fresh new collaboration with Camilo Lara, from The Mexican Institute of Sound (MIS). The track is the first advance single off their highly anticipated new album scheduled to be released in late May. Apart from the record, the band has also unveiled a slew of collaborations with the likes of No Te Va Gustar, Kansas City Rockers, Making Movies alongside salsa godfather Rubén Blades, and perhaps most notably with platinum-selling R&B artist Miguel. Flor de Toloache’s proven unique flavor and infectious sound will make you want to dance the night away to tropical places!! María Vázquez has been dancing flamenco her entire life, and has been teaching and performing since 1994. She has studied with some of the most well-known Spanish dance artists, including Caracolillo, José Galvan, Aida Gomez, Javier Latorre, Carmen Montiel and Manolo Marin. She received her degree in Spanish Dance from the Conservatory of Dance in Sevilla. She danced with the company Ciudad de Sevilla, touring Europe for two years. She continued performing with other flamenco groups in Sevilla until 2002 when she moved to Denver. She is the founder and executive director of Flamenco Denver, a non profit organization which mission is to promote flamenco dance as a living art form and a vital part of Hispanic heritage through classes, quality dance performances, and arts education programs that catalyze connections among young people and nurture the next generation of Spanish dance artists and educators.